The global smallsat sector is growing fast — the latest forecast predicts an 80 percent increase in launches this year when compared to 2016. According to the Motley Fool, prices for smallsats have dropped from $3 million to as little as $25,000. However, the small size that makes smallsats inexpensive to build also makes conventional control approaches impractical. According to Brett Streetman, senior member of the technical staff at Draper, as satellites get smaller, their size makes them difficult to maneuver. Natural forces in space have a larger disruptive impact on them and the spinning mass actuators that work well for larger satellites don’t work in the tight confines of nanosatellites. Smallsats range in weight from 1 to 10 kg (two to 22 pounds). Streetman and his colleagues studied the challenges—and came up with ways to surmount them. Streetman and fellow Draper engineers Leena Singh and Joseph Shoer set out to understand the limits of traditional satellite attitude control, a first step in designing a satellite as small as a postage stamp, but one that is equipped with something similar to control of a much larger satellite system. To understand the impact of these effects, the research team analyzed data from satellites ranging in size from the International Space Station to CubeSats 10 cm on a side. “What we found is that CubeSats are just about the smallest spacecraft possible unless you develop some new technology,” said Streetman. 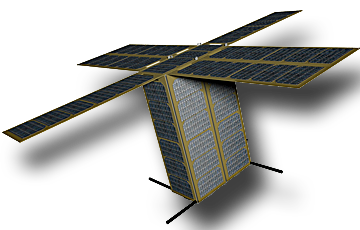 The standard 10×10×10 cm basic cubesat is often called a “1U” cubesat, meaning one unit. He added that in 1U CubeSats, up to half the mass is taken up by conventional stabilizers, leaving little room for sensors, radios and antennae, which are the reasons to put satellites in space in the first place. To make spacecraft even smaller, more capable and more accessible, a big advance is needed to forge ahead and build spacecraft, such as the even smaller ChipSats. Once the smaller scale of ChipSats are acquired, new missions are opened up — but to start, there has to be a totally different paradigm of control. Physics may provide the answer to controlling smallsats. Instead of seeing the natural forces of space as disruptive — forces such as drag, solar radiation pressure and magnetic field forces — the research team found a way to harness them. Their results, published by IEEE, are an important first step toward designing steering technologies for ever-smaller satellites. For Seamus Tuohy, Director of Space Systems at Draper, commercial space has many reasons to adopt smallsats. Tuohy noted that there are growing demands for Earth observation data and communications, which can be met through the use of ChipSats at relatively low cost. Within a few years, steerable ChipSats could be designed and deployed by the hundreds in a few weeks, delivering near-complete coverage of the Earth in less than an hour. The data could address a range of business and government needs, including search and rescue, wildfire containment, weather forecasting, agricultural planning and anti-poaching programs. NASA is encouraging the movement to smallsats, stating that they play a valuable role in its exploration, technology, educational, and science investigations, including planetary exploration, Earth observation and fundamental Earth and space science. As the agency stated, smallsats are a cornerstone in the development of cutting-edge NASA technologies such as laser communications, satellite-to-satellite communications and autonomous movement.